Ever had that moment that you have really awkward ingredients in your fridge that you never really use? Yeah that moment was how this recipe happened. I received cucumbers and radishes in the mix box from the local farmers market. All I have ever done with cucumbers is put them in salad. I had the idea to make some chorizo burgers and was searching for a great topper. 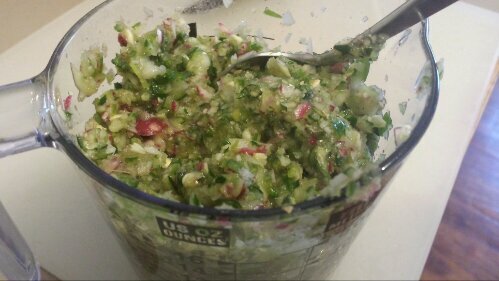 Guacamole is good, and why not use what I had! The cool of cucumber and radish plus the spicy of the jalapeno and sausage: a perfect match! Dice all the ingredients together except the avocado and lime. Cut and add each avocado and the pit to the veggies. Mash and whip all your ingredients together. Add salt, pepper, and lime to taste as you whip the guacamole. 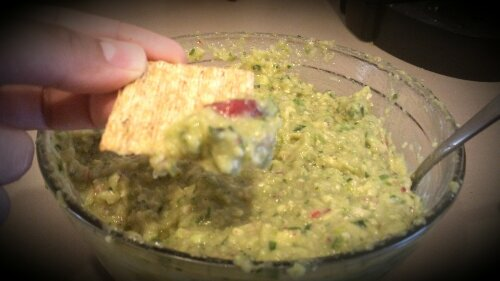 – Leave the pits in your guacamole after it is made, it keeps the guacamole greener longer!